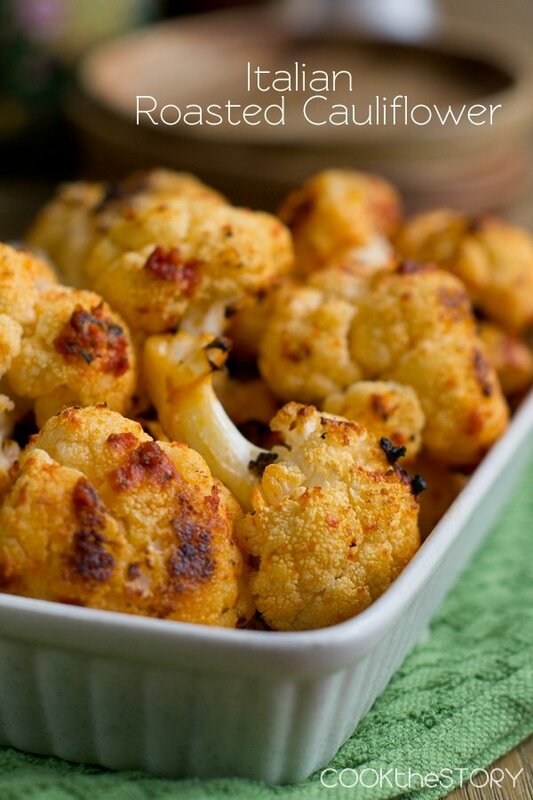 How to make roasted cauliflower better than ever by adding delicious Italian flavors! I’m in love with roasted vegetables. They brown at the edges and get so sweet and delicious. Way tastier than steaming or sauteeing them, definitely. What I love even more than their flavor though is how much easier they are to make than any other preparation. When you steam or sauté vegetables the timing is really specific; even a minute too long can result in overcooked mush. You have to stand over them, watching and stirring to make sure that they don’t overcook. With roasted vegetables, you can walk away. I set a timer so I don’t forget about them though. When the timer beeps, if I’m free, I check them and, if ready, I take them out. If when the timer beeps I’m in the middle of coloring with the kids or chatting with G or folding a stack of laundry, I leave them in the oven longer knowing that they’ll be fine. Roasted veggies are simply more forgiving than other types. A few extra minutes can even make them better since more time means more browning. 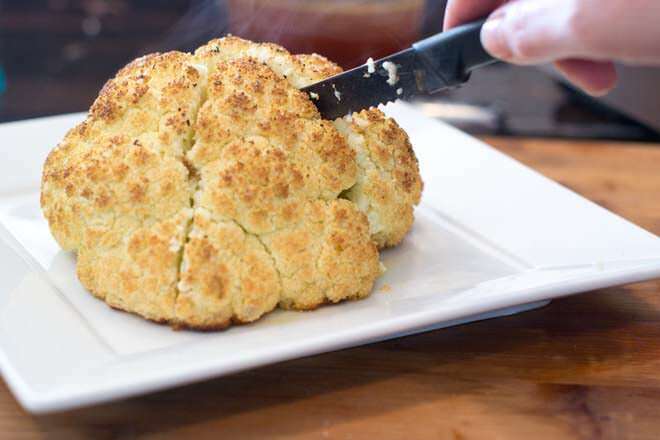 My favorite roasted vegetable is roasted cauliflower. 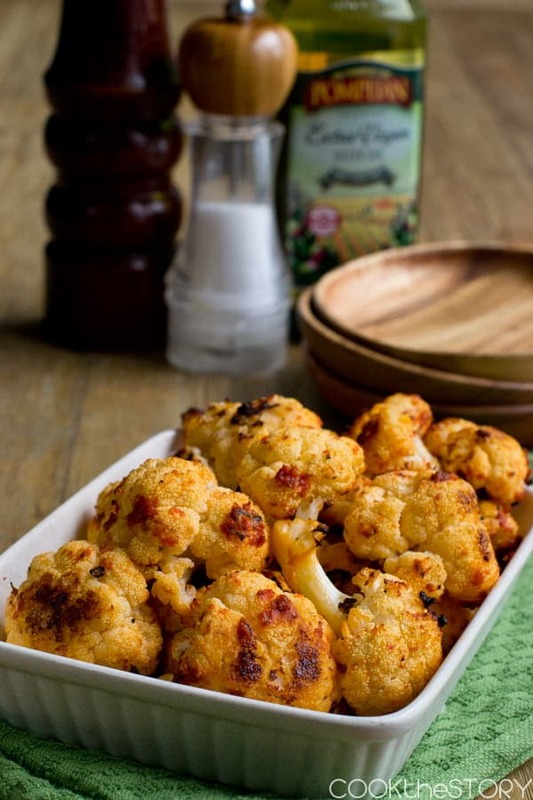 I never used to be a huge fan of cauliflower at all but roasting it was like a gateway drug. I became addicted to it roasted and then started to love it every other way. And while I now do all kinds of things with cauliflower (I even mashed it with chicken to make healthy chicken nuggets), I always go back to what got me hooked, sometimes adding some new flavors or methods to keep it interesting. To make it you whisk together tomato paste, olive oil and a bit of Dijon mustard. Note that the oil won’t fully incorporate. That’s o.k.. It might even be a good thing since I think that’s why some bits of tomato paste stay separate on the cauliflower and end up browning more. Then you add Parmesan cheese and seasonings before combining the mixture with cauliflower florets. Bake until it’s slightly darkened in spots and has the desired tenderness. For me, I like it not quite fork-tender, about 20-25 minutes at 425ºF. If you like it softer, you might want to roast it for longer at a slightly lower temperature so that it doesn’t get too dark before it gets soft enough. Roasted vegetables are as sweet as syrup. 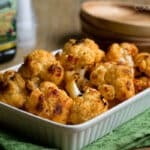 This Oven Roasted Cauliflower is no exception, except that for this one Italian ingredients are added to all that browned veggie sweetness for even more delicious flavor. And, the best part, it's easy to make! 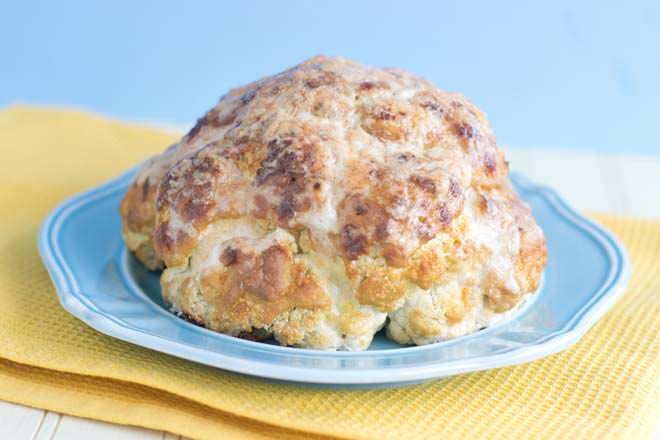 If you like your cauliflower more tender, roast at a lower temperature for long (e.g., 375F for 35 minutes). In a large bowl whisk together the tomato paste, olive oil and dijon mustard. Note that the olive oil will not fully incorporate. That's o.k.. Add 1/4 cup of the Parmesan cheese, the oregano, garlic powder, salt and pepper. Break a head of cauliflower into florets and add them to the tomato paste mixture. Stir using a spatula to make sure the sauce is getting onto the cauliflower, which should end up stained red. 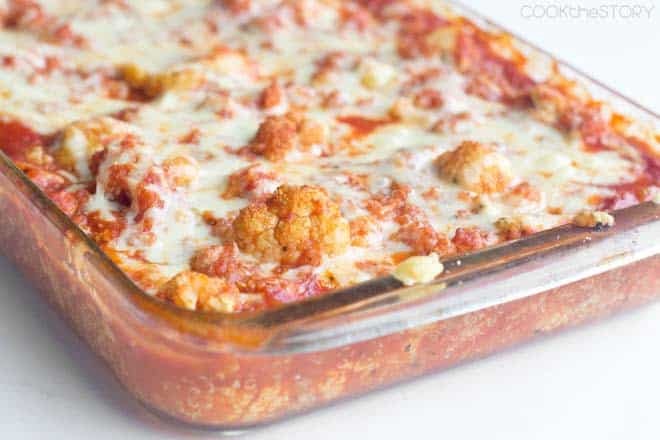 Use the spatula to transfer all the cauliflower and sauce to a large baking sheet. Roast until darkened in spots and is tender-crisp when stuck with a fork, 20-25 minutes. Stir gently with a metal spatula and, if desired, sprinkle with more Parmesan cheese to serve.